Top reta ilers know that a hot tub or swim spa sale will typically hinge on the selling experience. 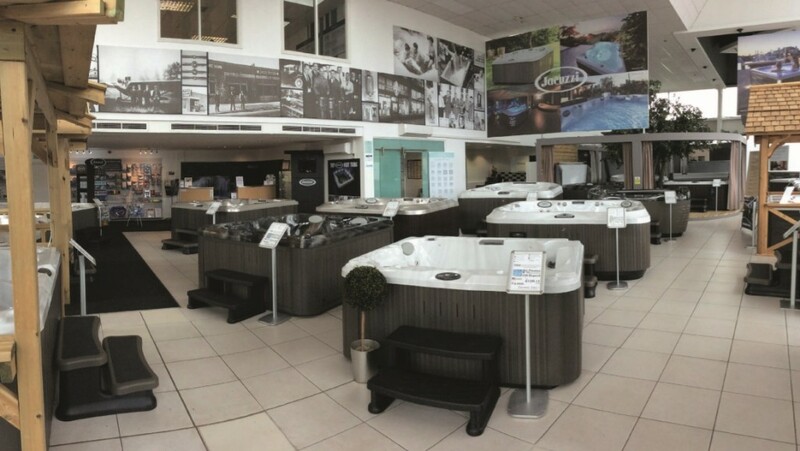 Businesses that can successfully demonstrate the hot tub lifestyle in a showroom setting therefore are generally a lap ahead of their on-line only competition. With high-end products and clients to match, showrooms in Loughton and Hertford offer customers of leading Hydropool dealer London Essex Hot Tubs, a tangible glimpse into a luxury lifestyle. The secret to London Essex Hot Tub’s success is making it real, they believe. “We have created various room sets within our showrooms which show customers how they could implement the products within their space,” explains Company Director, Meda Vlad. “We know it pays off because we often receive orders for these speciﬁc designs,” she adds. “This also makes the selling process easier as the client knows exactly what they will receive as the products have already been set out within one of our displays.” In their Loughton showroom, the company have three swim spas on display (one wet) and twelve hot tubs (one wet). Hertford has one swim spa and eight hot tubs (one wet). London Essex have well-conceived wet test facilities with a temperature-controlled environment, full shower and changing facilities, as well as little extras such as Hydropool towels and robes to complete the experience. Offering customers the opportunity to wet test the product and experience the quality and control of the swim, results in a more persuasive sale. After all, people who buy a spa are concerned about more than just how it looks; it’s about how it makes you feel. Family-run Castle Hot Tubs have been in operation in Haverfordwest, Pembrokeshire since 2002 and are dealers for Artesian Spas and Elite Spas. Their second, larger showroom opened on a Swansea retail park this May and is already attracting a strong customer base. “We have two wet spas on display in both showrooms and offer private wet testing after normal working hours,” explains General Manager / Director Yan Koob. Hull and Leeds-based Outdoor Living regularly rotate their 30 showroom models. Customers can check via their website to see what is currently on display or book a wet test. With a high rate of referrals and repeat custom, not all Outdoor Living customers request wet tests but Project Manager Georgina says it can be an invaluable tool to help customers select between models. Award-winning 1 Stop Spas has one of the UK’s largest choices of hot tubs and swim spas at their Lincolnshire showroom. Having increased the number of display models this year, Director Chris Brady estimates that the business has seen sales increase by 35 per cent on top of a record last year. The showroom now boasts 20 display models from leading brands Vita Spa and Marquis Spas – three swim spas and 17 hot tubs, including a minimum five units filled and ready to test at anytime. “Our showroom is key to year on year sales and wet testing is essential in a very competitive market place,” explains Chris. “We tell our customers that ultimately, they should make their mind up by wet testing and choosing a longstanding company that can support the customer through professional aftercare. “If you have excellent products, don’t be afraid to show them off!” says Chris. To read more about Hot Tub Showroom, please subscribe to Pool and Spa Scene here.